No idea where this originally came from, but it stuck in my mind since I saw a super-successful festival promoter post it in their Facebook feed... and today I thought I'd talk through some lessons here for DJs. You gave out 100 mixtapes and not a single promoter got back to you. Then it's definitely their fault you're not getting DJ bookings, right? Stands to reason. It couldn't be anything to do with you, could it? If that's your attitude, you're going nowhere. The reason is simple: In blaming other people you stop the conversation. It's their fault. End of. But if you keep an open mind, you see what really needs to be done. So in this case you may instead think: Did you package those mixes well enough? Did you follow up politely? Did you listen to feedback? Did you make a list of 10 things you could do better next time? Is this even the right way to go about getting booked? 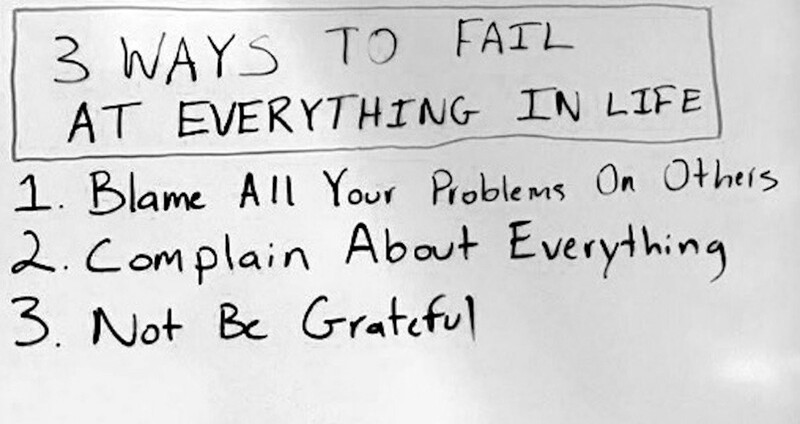 But if you blamed your initial lack of success on others, you wouldn't have asked yourself any of these things. Instead, you'll have blamed your failure on people who you cannot change. Stalemate. Try this instead: Realise that you make your own luck. Get up each day asking yourself how you can improve, where you can do better. I remember my first job out of school, sub-editing on a computer music magazine (sub editing means writing the captions, headlines and so on, and correcting people's writing style so their work is good enough to be published). Over a number of years I went from happy in my job to utterly miserable, and boy did I let people know! One time, one of my colleagues said to me: "Phil, if you're so f___ing unhappy in this job, do something about it. Leave! You're dragging us all down!" It hit me like a ton of bricks. And here's the lesson: Complaining, like swearing, is tempting, because short-term, it makes you feel better. But it's insidious, because it legitimises the status quo. It allows you to stand still instead of fixing the real problem. What really got me about my colleague's dressing down of me (thanks, Paul) was that I didn't want to be that person who made other people miserable - quite the opposite. I wanted to inspire people! I didn't know it, but that single moment shaped the way I was to carry on in life from there on in. Try this instead: When you find yourself complaining, stop yourself, and write down what you're moaning about and why. The next day, re-read what you wrote. You'll likely see the real reason you were upset - and know what has to be done to stop you feeling that way again. The fact that we can get out of bed, eat something, get clean, and head off out of our homes, knowing we'll be returning later with little chance of anything really bad having happened to us, means we are all - each and every single one of us, and yes, that means you reading this right now - the lucky ones. Sure, you want to be a DJ more than anything in your life. Sure, it's hard. Yup, I know you can't just go to college and earn a bit of paper that gets you a private jet and a calendar full of festival gigs. But the fact that you even have a chance to try is an immeasurable privilege. Here's the thing: By being grateful for what you've got, you're opening yourself up to the inevitability that one day you're going to lose it all. You're not here forever. None of us are. Your precious time here is a gift, and that realisation makes you a more generous, warm, and yes, grateful person. The outcome of that is that you enjoy each second of your journey. It's just that - your journey. Every up and down, every setback, ever laughable failure, every little win: you'll see them for what they are: Things to be grateful for. "Meet with Triumph and Disaster, and treat those two impostors just the same” said Rudyard Kipling. I read that as: Be grateful for them. That way you'll enjoy the journey, uncharted though it is. And there are few careers where the journey is as hard to chart as that of the DJ. There's nothing predictable about the rise to success in this profession. If you want it, you need to learn this one early. There are all kinds of things that mean we aren't where we want to be in our DJing. we may get crowds who don't want to dance, feel we need to play music we don't like, only be able to afford gear we feel is sub-standard, see other people where we want to be and wonder how long it'll take for us to get there, have to fight to get paid, and so on and so on. But I guarantee you that if you take ownership of all the problems that befall you, try not to complain, and see something to be grateful for every day, you'll be happier, more productive, and more able to stand the pace. And while not everyone with these qualities becomes a great DJ, every great DJ has them.